The absolutely amazing thing is that black crest doesn’t blow off in flight. 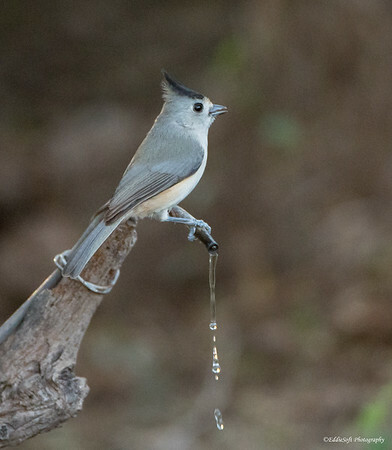 In case you are wondering what this latest +1 on my birding list is, they refer to it as the Black-Crested Titmouse. It also happens to represent the very last new bird that made it into the tin on that New Year’s trip. The first part of our trip was spent hitting our favorite spots along the Gulf Coast. After spending a few surprisingly cold days down in South Padre, we started our second leg of the trip hitting spots along the Rio Grande Valley. 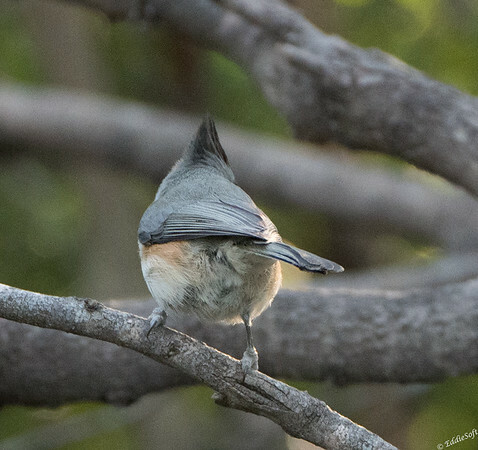 This Titmouse was spotted on my last visit to the Bentsen-Rio Grande Valley State Park. It was getting late on our second and final day at the park before starting the long trek back home. There was a Bobcat sighting at one of the feeding stations near the entrance to the park. The ranger lady at that station had informed us of recent sightings when Linda and I arrived in the morning. Definitely brought a high degree of excitement since neither of us had ever witnessed a Bobcat in the wild. There are a couple at our local Wildlife Prairie Park. Hope you agree… not the same as having an encounter with one in its true unconfined element (although, WPP does an excellent job creating natural enclosures within their forest). We gave up on the wait and opted to explore more of the park that morning. Sure enough, the rangers informed us that it had made an appearance not long after we left – crap! Giving it a final try, headed back there for one last look before the Sun signaled the next turn of the hourglass. It is a telling fact that the next picture after that statement was NOT a Bobcat. Nope, came up blank on that endeavor. In my best Soup Nazi voice – “No Bobcat for YOU!” I grabbed a seat on a nearby bench and took the time to simply enjoy being out in the field. There are times when the hunt becomes too much of the focus and you forget the real joy is just being able to spend time in the great outdoors. 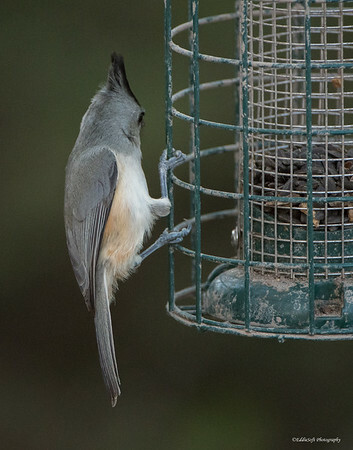 Then that god-awful hairpiece wearing bird flew right past me and landed on a nearby feeder. 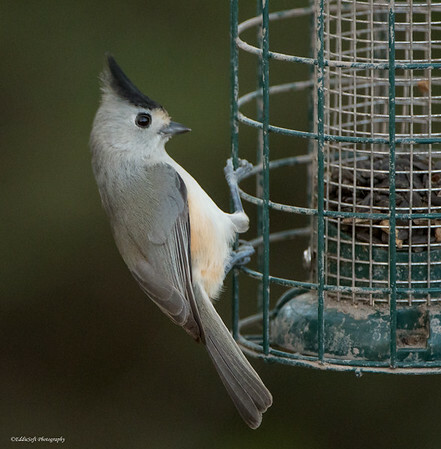 Admittedly, I was not entirely sure what kind of Titmouse this was – other than not the Tufted variety that hangs out here in the Midwest – the Tufted species are comfortable in their grey and need no emotional crutch to take on the day. Oh no, spent so much time talking about the experience, forgot to look into some reader takeaways. Let’s have a looksee over at Cornell. Ummm – that site is actually trying to claim that the black crest is their natural feathering – good one Cornell, that’s a laugher. 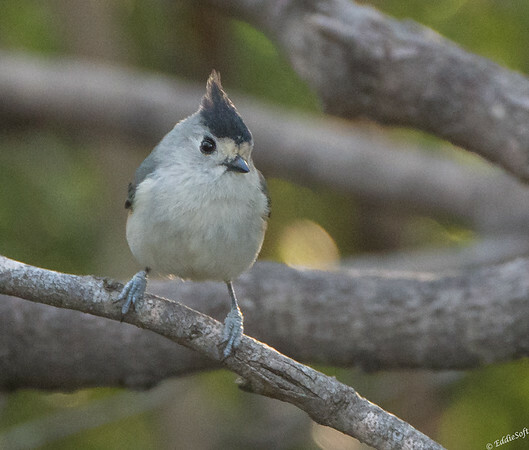 I was surprised at the small regional area these Black-Crested call home. Pretty much isolated to the middle of Texas down into northeastern Mexico. They are very similar to their Grey brethren, so much that they were once considered a sub-species of the Tufted. Their DNA diverged about 250,000 years ago – you probably just finished that last fact with the same odd expression I did. Just keep a straight face when you tell your buddies about your new found knowledge and they will think you’re a birder extraordinaire (leave the topic quickly before they start asking questions). and with that … THE END. ha, seemed fitting. Hope you enjoyed the post on my latest addition. If not, I promise I will try to do better next time. I like this guy. He wears his hair piece with style and is pretty cute. Nice post. Definitely comfortable in his own feathers … or rather a feather donation from a local Crow. At one point thought he would break into an Elvis rendition of Blue Suede Shoes. Glad you enjoyed the post – not a bad find for the last day of the trip. As always, appreciate taking the time to visit and share.